Dairy farming has been a family affair at Parkend Farm in Scotland for three generations. But keeping an eye on the cows has never been easier. On his smartphone, Brian Weatherup receives automatic emails from the farm’s computer system, that alert him of any changes in the cows’ health or fertility status. The data is collected by collars the animals wear around their neck. 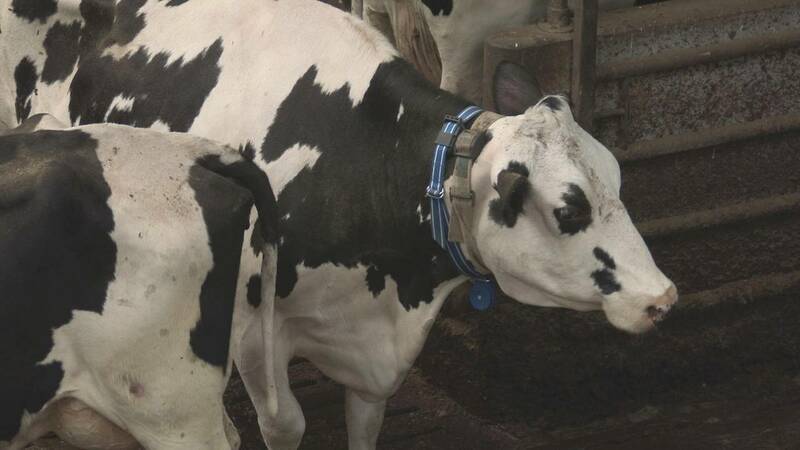 “The collar indicates that there’s been a drop in a cow’s average eating time or average rumination time or average activity. And any one of these factors could be a primary indicator that the cow is either sick or just starting to get sick, and the key factor in these collars is that they can pick up these problems before they become very serious,” Brian explains. When the animal eats, its neck muscles move – the movement is captured by the collars’ sensors, and wirelessly collected and processed. The collar’s developers are planning to add location tracking, which would be particularly valuable for free-grazing cows. Milking robots measure the volume and composition of the milk produced by each cow. Farmers use this data to boost productivity and improve the well-being of their animals. These and other smart innovations are being studied at farms across Britain as part of an EU-funded research project aimed at making agriculture more sustainable and more efficient. Ivan Andonovic is a researcher in communication systems at the University of Strathclyde in Glasgow, which is a partner of the project. “What’s happened with the technological evolution over the last ten years is that processing power has become cheaper, the energy spent in processing has dropped, and the functionality – the form factor, the shape, the size of it – is much more manageable. It’s only under those criteria that you can use technology to create an economic solution for the farming sector,” he says. Brian says that in the six months since he adopted the new technology, production has increased by one fifth and his animals’ health has improved, too. Researchers see even greater potential in integrating sensor data along the production chain, by developing a common standard for data exchange. “The way we can have a real impact and make life even easier for Brian and his colleagues in this sector is to create a consistent and coherent database which takes both the data coming in, the collar system, and the output, the robot system, and then match input to output,” says researcher Ivan Andonovic. For the next part of our report, we head to Almería, in southern Spain, otherwise known as the sea of plastic: tens of thousands of greenhouses that supply much of Europe with tomatoes, bell peppers and other vegetables. It is also a study site. We visit an experimental greenhouse rigged with sensors. “We’re trying to simplify the acquisition of data for growers into one single cloud database. Then, using artificial intelligence and big data technology we’ll be able to reach certain conclusions, for the entire region, and this will allow us to compare and further improve the way the product is grown,” explains Manuel Berenguel, Professor of Systems Engineering and Automatic Control at the University of Almería. Soil moisture, plant growth, the composition of the air inside the greenhouse and other indicators are measured to help farmers grow better products while optimising irrigation and the use of fertilisers. On a large scale, smart farming has substantial economic benefits for the producers. Cynthia Giagnocavo from the University of Almería is part of the team working on the EU-backed research project. “The Internet of things and these sensors and all the information – all the data that we’re gathering – can be aggregated at certain levels, fed into the cooperatives, and used to give feedback, so that they can have much better sense of their processes of production, their efficiencies, their water use, the amount of labour that they put in – whether it’s market information, are they producing the right varieties, etc etc,” she says. Once the tomatoes are picked, the data harvesting continues. Two million kilos of tomatoes are processed in this sorting facility every day – and the bulk of the work is done by machines. They take pictures of each tomato, which is then automatically sorted by size, colour and even taste. Researchers are working on gathering all the information, from greenhouse to processing, into one single database. This would provide traceability from farm to store, increasing food security and making the whole chain more efficient. There are plenty of other uses for sensors – including below the sea. What is, for example, the fastest and most reliable way to measure water pollution? We’re off to southern England where researchers are testing a new mini-laboratory to analyse water. Urban and rural waste often ends up in bodies of water, which get contaminated with excessive nutrients, in particular nitrogen and phosphorus. To protect underwater ecosystems, communities are taking measures to try and limit that pollution. The problem is that the concentration of nutrients varies throughout the day: onshore laboratories can’t measure the changes in real time. So the solution is for the labs to go under water. “Rather than taking a sample and analysing it in the laboratory, we can leave the sensor deployed in-situ for long periods, and it can take a measurement every 15 minutes and collect really long data sets, giving some very high resolution data, which allows us to pick up some of the trends which would not be visible if we were just taking samples periodically,” says Alex Beaton, researcher in sensor development at the National Oceanography Centre. The device Alex is using is a called a “lab-on-a-chip” – it’s a relatively compact and inexpensive system that integrates various laboratory functions and is easy to use. The goal is for non-specialists at wastewater treatment facilities or even ordinary citizens to be able to take measurements and control water quality. The lab-on-a-chip is based on a plastic plate tunnelled with complex pathways for liquid reagents. Optical sensors are added to spot colour changes that indicate the presence of particular substances in the water. The chemicals are all safely stored inside the device. “This system is designed to go to the bottom of the ocean, so we’ve deployed them to about 5.000 metres, and they should be able to go town to 6.000 metres – we’ve tested them here in the pressure test facility down to 6.000 metres,” explains Alex. The researchers are working with private companies to improve the sensors in terms of functionality, cost and size – like this commercially available fluorometer that measures hydrocarbons contained in water using the fluorescence of organic molecules. “One of the aims within the project was to take what is a wide range of sensors and narrow it down to a single design that could cover all of our applications, making it much easier to manage in manufacturing,” says John Attridge, optical engineer at the Chelsea Technologies Group. Simplifying manufacturing: that’s the challenge. We travel to the Danish university city of Aarhus, where we meet a company that produces extremely accurate microsensors used by researchers all around the world. Each sensor is made by hand from a glass tube. The opening must only be few microns wide. It’s a meticulous job that requires a steady hand – and a lot of patience. “I can make maybe 20 a week that work (laughs), of the standard one. The oxygen sensor is the standard sensor, so they’re the easiest to make,” says lab technician, Rasmus Eliasen. The oxygen molecules pass into the tiny opening through a membrane and interact with a thin platinum wire, producing a weak current that can be measured. Such microsensors are used in a variety of fields, from blood analysis to pollution and greenhouse gas emission control. To meet this expected demand, developers are working on new mass-production methods to replace the glass with plastic, increasing the microsensors’ longevity by making them more resilient and eventually more affordable. “When we compare the two sensors here – internally they have the same dimensions: the membrane is the same size, the number of molecules that passes over the membranes is comparable, but they are constructed in a very different way on the outside. And this is mainly to achieve robustness. And of course we can produce this at a different price than this glass one, because this one is handmade,” says chief technology officer Søren Porsgaard. From greenhouses to the bottom of the seas, these innovative technologies not only help better understand our world, but also boost productivity and the debate enhanced production generates.